This fabulously feminine sweater makes such a pretty statement. Soft pink and ruffles are always a yes in my book. Do you remember a couple weeks ago, back in this post, when I stopped at a darling road side farmer's market and they mentioned the trees would be changing soon. Well we drove by over the weekend and it is gorgeous!! This little side road is just darling. Picturesque Fall!!! As we were taking pictures, there was a big car crash just on the other side of these trees! We couldn't see it, but the sound was horrible! This sweater is really at an affordable price point at $56. It's also available in navy and I linked some similar ruffle sweaters below. I prefer my sweaters a little oversized, so I sized up to a medium. I love the loose fit. This week's feature blogger is Kim from Champagneista. We adore her 'What to Wear for Fall in the South' post here. Even here in Ohio, the weather this Fall has been so warm! It was 82 yesterday and 83 today. Crazy. Her look is Fall perfection! Check out her blog here. Here is today's Tuesday Fashion Party Link-Up! Ruffle gorgeous!!!!! 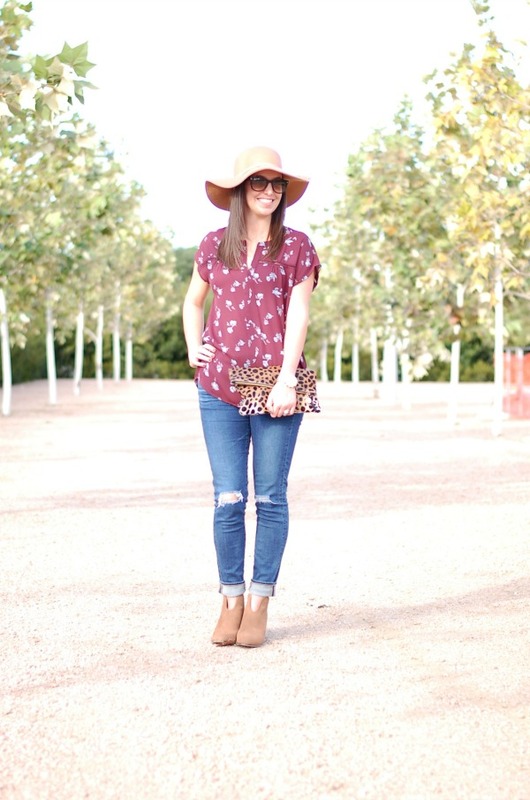 With the pop of leopard, this is the perfect, chic, Fall outfit!! You look sensational!! Gorgeous top and road indeed, glad you found both gems. Love the blush color! It goes perfectly with that leopard print. This is a great way to do ruffles---they aren't right in your face, but they add so much dimension to the shirt!! BLush pink with ruffles is always a good idea!!! 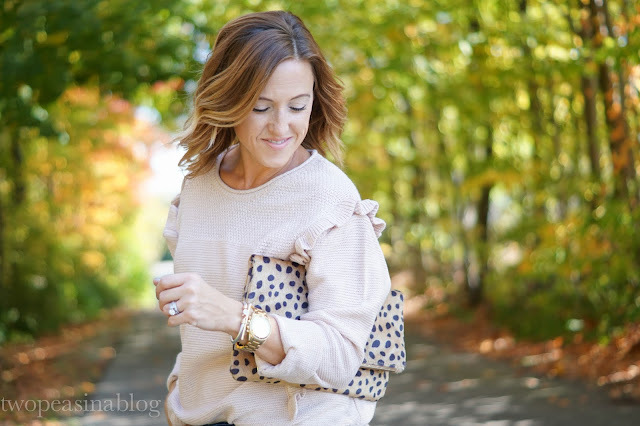 I love the ruffle detail on your sweater, and the blush color! Such a pretty look! Such a gorgeous outfit and photos. I always love coming to your blog to see what you have come up with. This sweater is so great and perfectly styled! 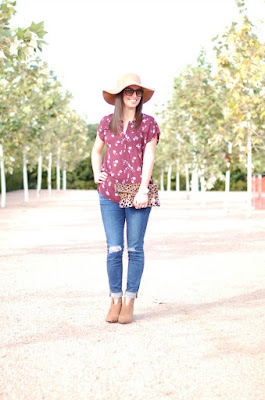 You have two of my favorite trends on, ruffles and animal print! That animal print clutch is just the best! Beautiful blush sweater with ruffle details! Love the way you styled it. Love your pop of leopard! Thanks so much for the feature! :) I adore the ruffles on this sweater and how you paired it with the leopard clutch and those neutral heels.